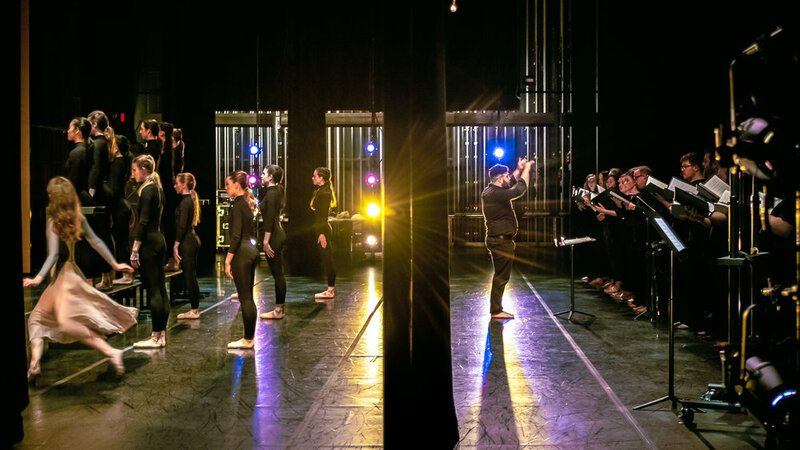 This December, Verdigris performed its most ambitious project to date when they and Avant Chamber Ballet brought David Lang’s The Little Match Girl Passion came to life on stage at Moody Performance Hall. As a singer, I can attest to the emotional impact felt by both musicians and dancers as we shared the stage to tell this affecting story. Dickie Hill joined us for our dress rehearsal on Thursday night before we opened the show. Step through his lens to view this collaborative effort up close. In our initial planning conversations, Sam, Katie, and I felt that having the singers in bare feet would connect the ensemble to the narrative and the bare feet of the little match girl. Peep the toes in the upcoming photos. Avant Chamber Ballet dancers used recordings for the initial stages of their rehearsal process, so aligning tempi was an important part of our rehearsal, as each ensemble adjusted to the needs of the other. Emily Dixon Alba, who danced the role of the grandmother, spoke with Theater Jones about the experience of putting this piece together with live music. At the end of the rehearsal, each director met with their ensemble to clarify and clean up any moments that needed refining. The piece started and ended with Verdigris standing in front of the curtain. As we walked to and from our places, we took extra care to move with uniformity and grace. Katie had us initiate every position shift with the right-hand side of the body - step with right foot, turn over right shoulder, etc. I still get a rush of emotion thinking about the two scenes shared by the little match girl (Juliann McAloon) and the vision of her grandmother (Emily Dixon Alba). My brother was in town to see the show, and both he and I could hardly speak coherently about the duet between girl and grandmother, the only character who shows love the little girl. As we sang, most of us had to intently concentrate on our music and train our eyes on Sam, lest we get caught up in the emotion of these scenes and lose the ability to perform effectively. The little match girl dies and the dancers change to a white dress of mourning. You can (and I would highly encourage you to) read the whole libretto. This performance received generous reviews in D Magazine who called it “shimmering in its terrible beauty.” Theater Jones called the collaboration a “bold endeavor…impeccable, cohesive.” Cheryl Callon called the collaboration one of the North Texas standouts for 2018. Katie Dravenstott also chose it as a highlight of North Texas dance for 2018. We are finishing 2018 feeling a deep sense of pride and gratitude. Pride in the ways we’ve brought beauty and creativity to Dallas, and gratitude for the donors, patrons, and collaborators who have been part of our rapid growth. Consider helping us reach our full-season funding goal of $60,000. We are almost 60% of the way towards successfully funding this entire season’s lineup of significant, innovative projects.